I never thought Lyme Disease would lead me to the Amazon Rain Forest, but in fact it did. I Journeyed to visit a Shuar Medicine Man named Kiap Uyunkar, meaning black jaguar healer. That was his Shuar name, but we all called him Juan. As if my 7 years on the path in search of healing hadn’t taken me to outrageous places already, both in the world as well as in my soul. My mother, who so graciously funded this expedition, said to me that she believed in the ability of the earth and the plants to heal the body. She also has a great faith in her heart about miracles. 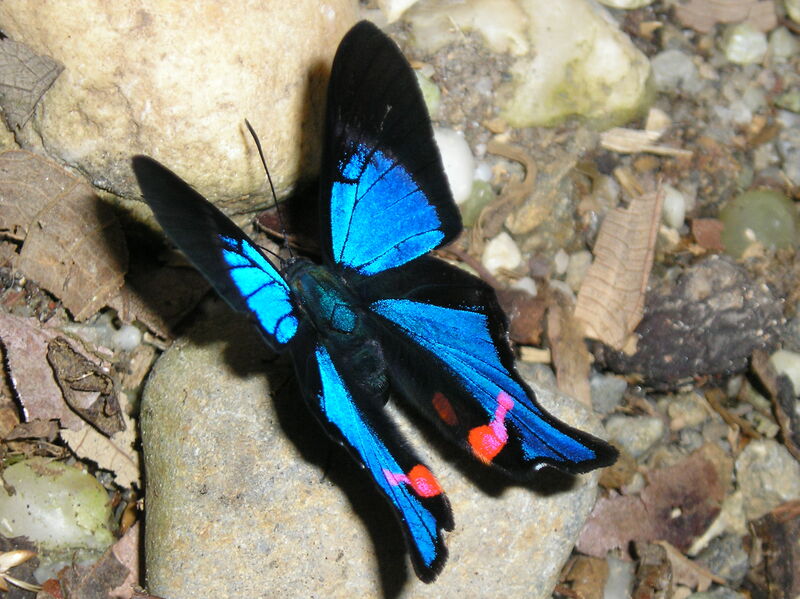 She told me about a movie called “The Blue Butterfly”, and that the boy in the film went to the amazon looking for the Blue Morpho as his last wish, he had a terminal brain tumor. His search ended in the total and complete healing of his tumor, it was a true story.I hadn’t seen it. So as far as Shamanism goes, that was my Mom’s frame of reference. I, however, have been more deeply looking at esoteric healings for quite some time, given to the lack of cure western medicine has provided. It is also my spiritual path. So with Mom funding the trip, I was on my way in search of healing. I knew the travelling would be hard and that the journey itself would require deep internal and physical strength and an open channel of willingness on my part. One of the principle plant medicines used by Shamans of the Amazon is Ayahuasca. I had had one previous experience with this medicine and it is intense to say the least. So with all of this ahead of me, I knew my previous spiritual disciplines and practices would play a major role, and that I would have to make use of all of my personal power to overcome this disease. As I boarded the plane for Ecuador my heart and mind were filled with excitement and fear and I employed my faith to enter into the deep unknown. I felt Alive, really alive to be embarquing on such an incredible journey. We arrived at the hotel in Quito with my fellow group of travellers, and were to be there two days before heading to the jungle. We all exchanged stories of our purpose for being there and started to coalesce as a group. It was exciting. Then as I was walking to the cafe, I saw Juan and instantly recognised that he was our Shaman, in fact I felt an instant soul connection with him as if recognizing an old friend. His eyes were filled with light and we hugged. I employed my beginner level spanish and said, “mucho gusto”. I could tell instantly that he was a being of light because he simply radiated. I felt at ease that I was in the right place, that my heart had led me down the right path, and that I had a profound journey ahead of me. The next day we headed out, Juan said a prayer to keep us protected on our 6 hour journey to the Amazon. We all squeezed into the transport van and began our new adventure. We stopped to see Cotopaxi, a breathtaking volcano that is 20,000 ft high. Ecuador has many active volcanoes. In fact, everything about it felt alive. The earth was wildly alive with a living force that filled me up, and even the hearts of the people were alive and I could feel their heart centeredness. I had never seen such loving men with open hearts that exuded true masculinity. As we neared our destination it began raining, and not the kind of rain I’m used to, it was sheets of rain. We stopped to pick up our rubber boots, that were a total Godsend the entire time, and by the time we reached camp it was well into the darkness of night. We were greeted by Juan’s family and everyone helped the “gringos” get our bags to the hut, it was really a hut. I was overwhelmed at the reality of living in the jungle, although admitedly exhillerated. The bugs were abundant, and I found my way to my bed which was minimal. I was disoriented and going through a wild stream of emotions, but still the excitement outweighed my fears about roughing it. Little did I know that that would be the easiest thing about the next 10 days. We would begin our ceremonies in two days. The next day we acclimated, we talked, and Juan delivered the first of many different kinds of medicines. It was a tea concocted of 9 different plants he went out into the jungle to pick freshly that morning. It was boiled down and made in a 5 gallon stainless steal pot. He started to talk to us about the purpose of the tea and how to take it, it was a purgative mixture that worked through making you sweat and urinate profusely. It was to begin cleansing us of our impurities before our ayahuasca ceremonies. He insisted we must drink as much as we can, cup after cup, and to continue to sweat out the poisons in our bodies. “Very important” he said, “keep drinking and purify!” I must have drank 20 cups that day, and I felt exhausted, both from travel and from the cleansing effects. God knows I was toxic with all the pills I had been taking for years, everything from antibiotics to painkillers, and then of course the toxins that lyme produces, they were all coming out. I zombied my way through dinner that night and went to sleep. Juan was already teaching me so much about nature and life. They had cut down fresh trees that would burn for the next ten days because they burned only on the inside. One log had been a home to hundreds of “hormigas” (ants) and I said, “how will this be ok”? I mean it was right in our “living room”. Juan insisted, “no, they are our family” and on the hole out of which they poured he placed his hand. He left it there and allowed his family to run all over him. Then he grabbed my hand and pulled me to the log I had made my mind up to avoid, but something about seeing him do it and not have any fear transferred to me. I knew what he was trying to teach me, and I let him place my hand on the grand central station of ants. I felt calm and I think exuding that calmness had an effect on the ants, they could feel it and most of them curtiously walked around my hand, although a few decided to explore the new territory. This was my first lesson from him showing me that the Mother, our Earth, is our family and that there is an interconnectedness we share with her and all living beings. Juan was born in the jungle, and this interconnectedness was his way of life. He was born to walk the path of the Healer, the Doctor of his tribe. In Shuar they call him an “Uwishin” which means doctor. In fact he told me that before he even had breast milk after birth, he was given the sacred medicine of ayahuasca. He was a man that I could see had deep deep wisdom, and I felt honored to be learning from him. His tribe’s direct lineage of teachings went back 100,000 years, from the Elders to the Young, generation after generation. Unfortunately he seemed to be one of the last to be carrying on the tradition in it’s original form. Ayahuasca is a sacred brew that has been used by shamans of many cultures in south america for thousands of years. It is an intelligent medicine that helps you to face yourself, your fears, and your internal world. Physical healings of miraculous quality are known to take place when people ingest the medicine. These claims are what peaked my serious interest about the brew, although I had heard stories from many friends over the years about the spiritual process of taking the medicine. I found little to no information on the internet about ayahuasca and lyme disease. This makes sense because they don’t have lyme in South America, and it is a relatively new illness even where it is epidemic. Western medicine has offered treatment for the chronic form of lyme, from which I suffer, but has delivered a cure to only a small few. So when I found Juan and heard that he had experience with several lyme patients over the past ten years, I knew I had to explore it further. Juan had treated exactly four lyme patients, and all had recovered a good part of their health from his treatments, however none had been cured. This was something Juan was not aware of until I brought it to his attention, and he looked further into the nature of the disease and why it relapses. During my assessment with Juan he explained that they did have the disease in his culture, but it was isolated to the animal population. In Shuar it was called “Muah”. He told me he had spoken with other doctors before I came to inquire more about it, and had used his visionary abilities to gain a deeper knowledge of the disease. What he saw was that lyme worked as a male and female energy in the body. When the male aspect was active in the body, the feminine would be asleep and vice versa.They worked together. This allowed it to survive almost any treatment and explained why lyme relapses so often. That the bacteria had a protein coating around it that kept it safe from medicines intended to kill it. All of this concurred with what I already knew about lyme. He said the ayahuasca would dissolve the protein coating, but that it would not kill the bacteria itself. That to truly cure the disease, it must be a continuous treatment over many months in six day cycles. Six days on the ayahuasca and six days on herbal antibiotics. He told me that lyme is harder to cure than cancer, but that it is curable. He emphasized, “it is curable, not incurable”. This gave me a lot of hope, although I knew my two weeks in the jungle with him would not be enough to affect a cure, and that this would be the fight of my life. He talked with me of working together to discover the true cure, and that I could stay longer to work with him. The day of our first ceremony arrived and we all anticipated nightfall. The ceremonies are performed at night in Juan’s tradition, in many shamanic traditions actually. Because it is a visionary medicine, the backdrop of a night sky makes the external world less important and allows you to go more deeply inside. That is where the healing takes place, inside yourself. That afternoon he took me aside and I began the first of my initiations. We sat side by side in the medicine circle, with the Pestaza river rushing endlessly behind us. Until that moment, I had seen Juan as a lighthearted spirit filled with wisdom. But now it was time to be serious. He began to center himself and his internal power became evident. He held a white bottle of liquid tobacco and began showing me what to do with it. “Tobacco is a sacred plant, very very sacred to my people”. He demonstrated the ritual to me, cupping his hand and stabalizing the liquid in his palm. He moved slowly and lifted his palm to his left nostril, snorting the liquid up one side and allowing it to settle at the back of his throat. He leaned forward letting it come out the other side. It reminded me of the neti pot that Indians use to clean the nasal cavity, which I had done many times. But as I took my first snort, I realized, this was not the same thing. The liquid stung and a burned as it hit the walls of my nose. I began to gag violently and mucous loosened from all of my passages. My ears opened, my vision became sharper, and then he told me to go lay down and rest for the ceremony.